On Dec. 17th, President Peter Salovey performed a “virtual ribbon cutting” for Yale’s new Brain Imaging Center from within its fMRI machine. 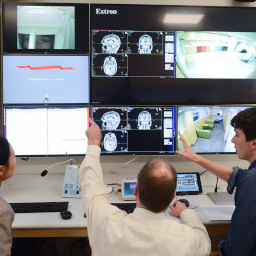 The center will assist in a wide variety of research projects, such as tracking changes in brain from infancy through development, searching for networks involved in cognitive, emotional and behavioral disorders, and even tracking brain activity as people interact with each other. Read the full article here.